I’ve been playing around with a miniature that my friend Doris made for me a while back. I layed a quarter on one of the squares to show the size. 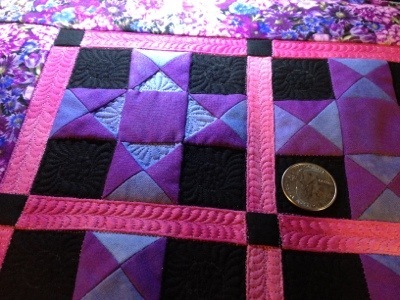 I Don’t know why I like to play with quilting miniatures because I sure don’t like piecing them!! LOL!! I have enjoyed following your quilting adventures and I am nominating you for the Versatile Blogger Award. You can see more about it on my latest blog post.